Say Goodbye to old equipment and Hello to new equipment! Say Hello to our new 6 yard bins! The 6 yard bin will be able to accommodate larger loads of concrete, dirt, brick, rock, sand, asphalt, etc. at the same starting rate of $285.00 plus sales tax that includes up to 1 ton of disposal weight, the delivery, removal and up to 7 days of rental. Keep in mind if the debris is clean concrete, dirt, brick, rock, sand, asphalt, etc., we will not have to weigh it on the scale. We are ending this year with a new truck fleet! In addition to our F-550 trucks, we are bringing in an M2 Freightliner truck to better assist with our heavier loads, including our new 6 yard bins that will hold more dense materials. Please keep in mind, a larger truck cannot fit in tighter spaces like our F-550's can, alleys and tight single lane driveways can be an issue for this heavy duty truck, along with front and back yards. 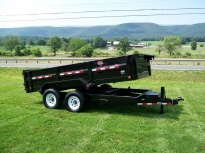 WE OFFER 14 YARD HAULING TRAILERS! in October 2016, we added hydraulic hauling trailers to our fleet to better serve you in different aspects of your business! They are great for street placement (since they will have wheels, usually a permit is not required), great for roofing projects, avoiding low overhead wires or trees, and can be delivered in franchised areas. The trailers are 14 cubic yards, starting at $335 for up to 10 days of rental. Once inventory increases, we will be able to provide you with up to 30 days of rental. We will need a 48 hour notice for scheduling as they will be delivered by a different truck than the Ford 550’s that deliver the dumpsters. We will provide blocks and chalks with every trailer for safety and of course sweep up under the trailer before we leave. As a friendly reminder our operating hours are Monday thru Friday from 7am to 6pm and Saturday from 8am to 12 pm; closed on Sundays. We do offer after hours delivery and removals at an additional cost if ever needed.